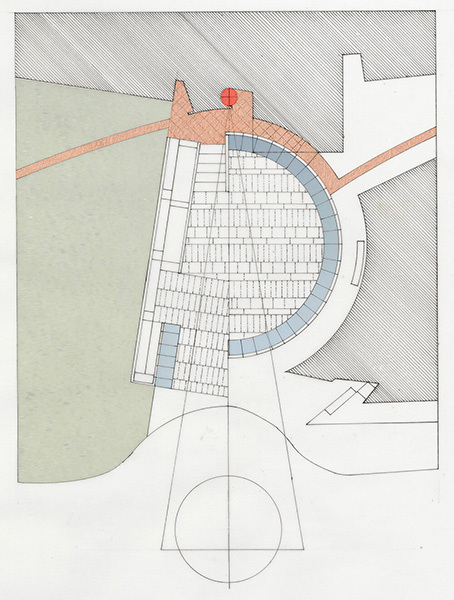 The original campus masterplan is based on buildings radially set out along the contours of the site. Two “rings” of buildings, allowing a pedestrian route sheltered from strong winds and buildings are arranged to maximise southern aspect and fine views. 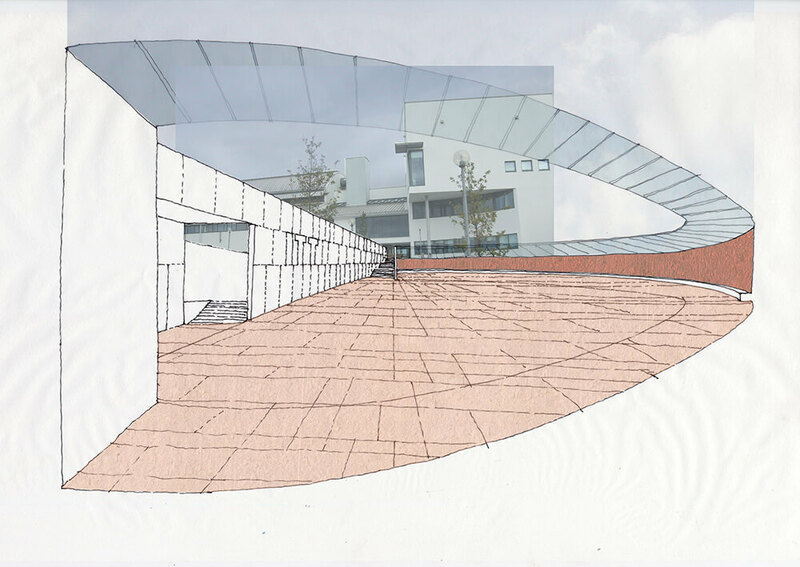 With the completion of the new library CCN were requested to consider the interstitial spaces between the buildings and create a new gateway, which creates a clear identity and orientation mark to the campus as well as facilitating social interaction between staff students and visitors. 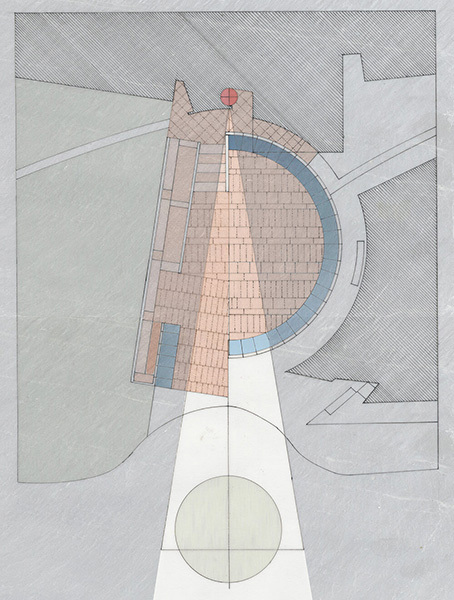 It might also provide shelter from the wind and rain and be made of robust materials that will weather and improve with age, yet be compatible with the mainly monocolour palette of materials already used on campus. 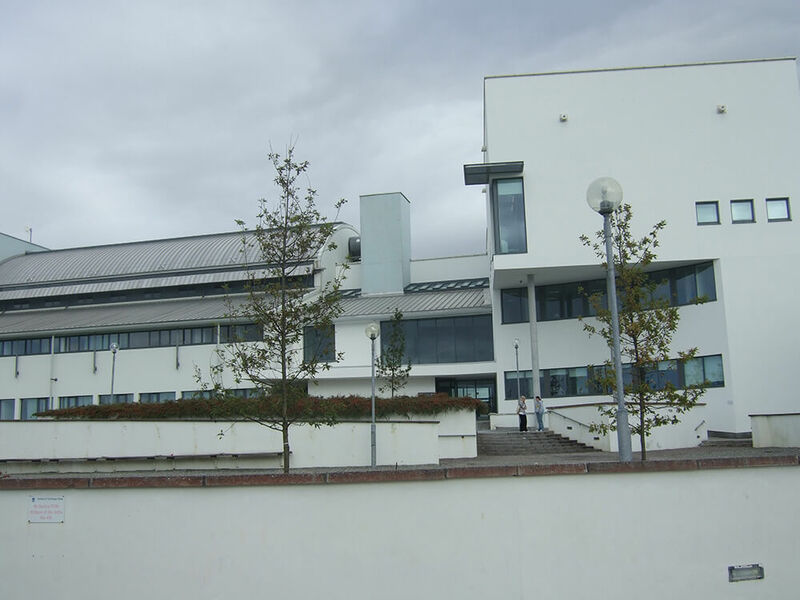 The campus is in a unique setting, commanding views of Tralee and the bay beyond. 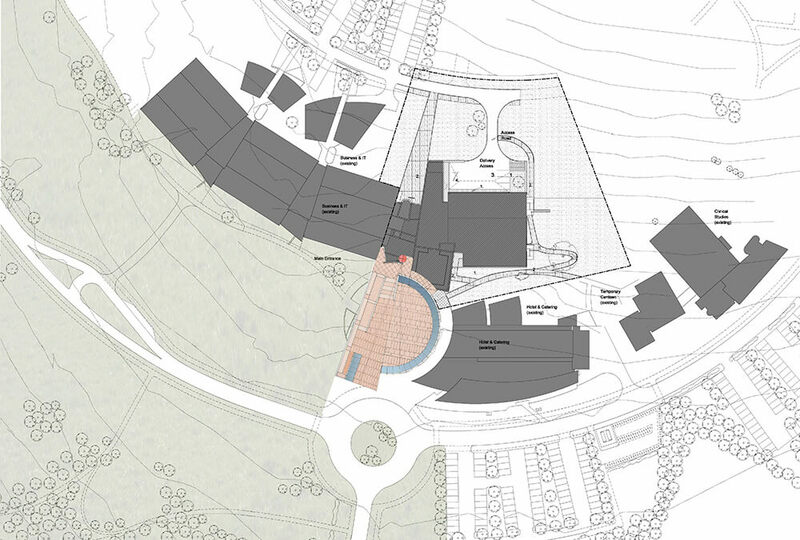 This distinctive hilltop site brings its own challenges, and its exposure demands a secondary layer of cultivation and settlement to bring shelter and a sense of identity to the college. Just as the institute itself is maturing and evolving, so too must walls hedges and trees colonise the interstitial external spaces, but in a coherent and articulate way that is sympathetic to the overall structure of the campus. Make a coherent and enclosed semi-circular space. Like an outdoor room this will provide a place for students to sit and meet. A low wall on the footprint of the existing forms a seat, while a trimmed hedge of bay laurel will provide shelter on this exposed site. 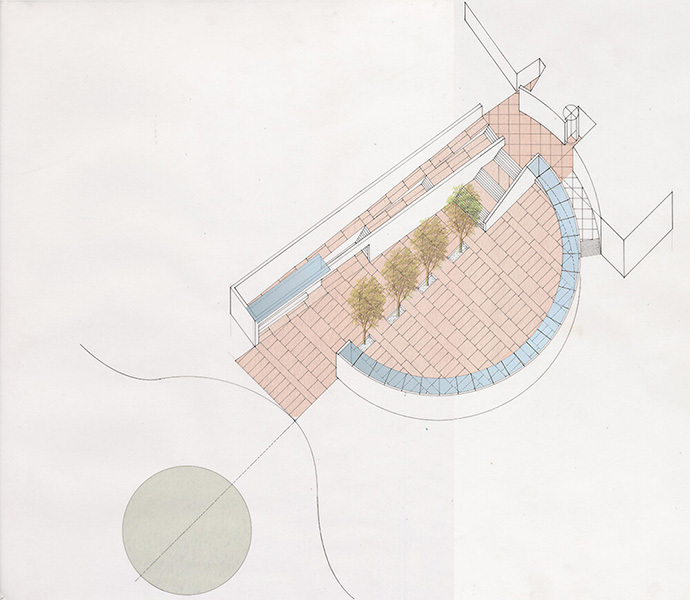 The end wall of the ramp is configured to make a place for signage and a seat where people can wait for buses, sheltered by a cantilevered canopy. 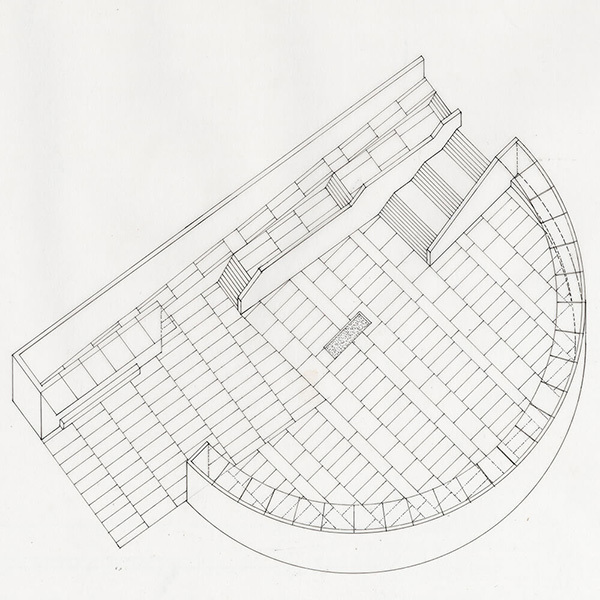 A gentle ramp is provided for universal access as well as flights of steps, which become tiered seating facing the sun. 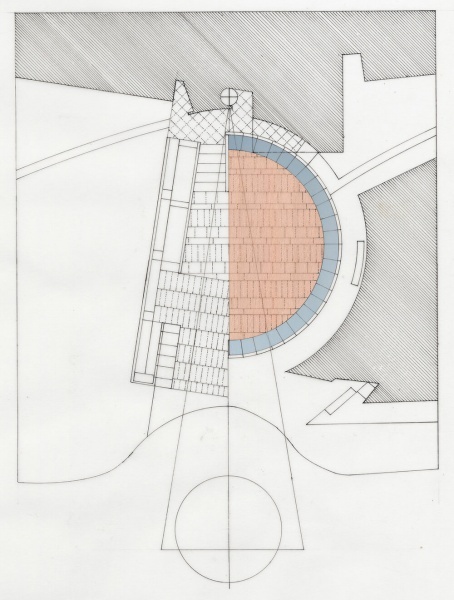 The change in level around the rear of the circular enclosure ramping up to the library provide a place for students to sit and meet. A low wall on the footprint of the existing forms a seat, while a trimmed hedge of bay laurel will provide shelter on this exposed site. The end wall of the ramp is configured to make a place for signage and a seat where people can wait for buses, sheltered by a cantilevered canopy. become tiered seating facing the sun. 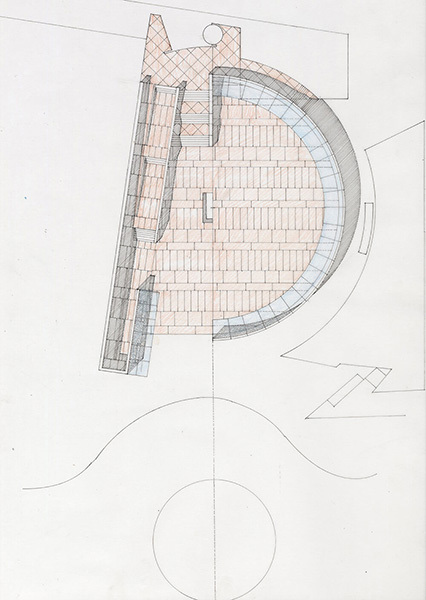 entrance means that views out are retained from the building, yet maintaining a sense of enclosure within the curved space. The walls were to be constructed of reinforced concrete with GGBS replacing up to 50% of Portland cement, giving a smooth white appearance to the concrete. The concrete will be profiled in certain locations as a decorative device. The paving surface will be a fine polished concrete finish, with specially selected natural stone chips and pigmented matrix. The concrete will be divided into bays to minimise cracking. Handrails will be durable hardwood to optimise legibility for the less able, with stainless steel supports. Lighting will be discretely incorporated into the walls and a line of simple light standards will punctuate the space and provide markers to the axial route up to the entrance.